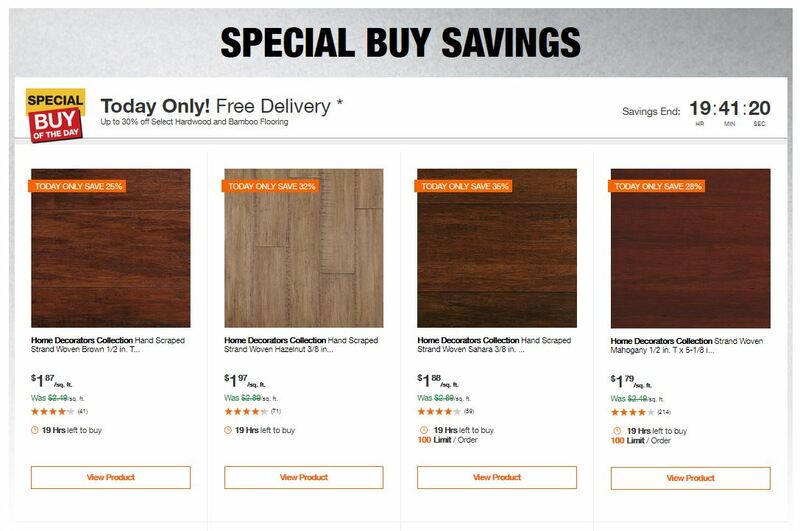 Today Only, Home Depot offer Up to 30% off Select Hardwood and Bamboo Flooring. Shipping is free. 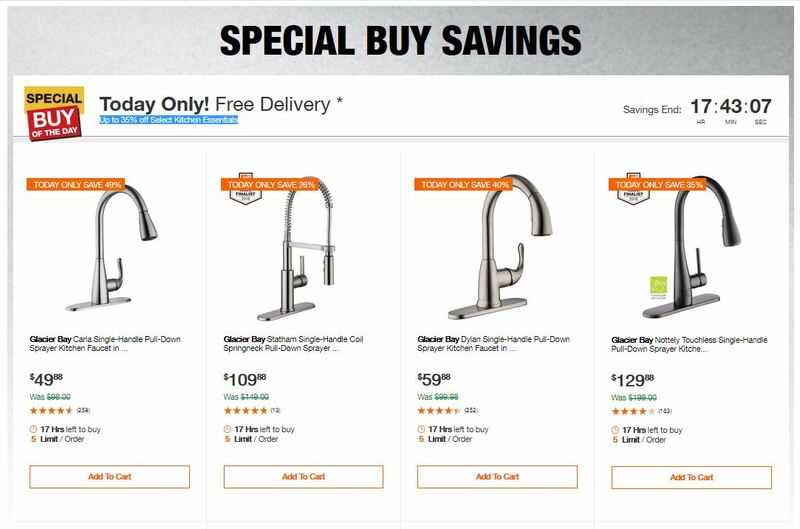 Click on the image below to get the deals! 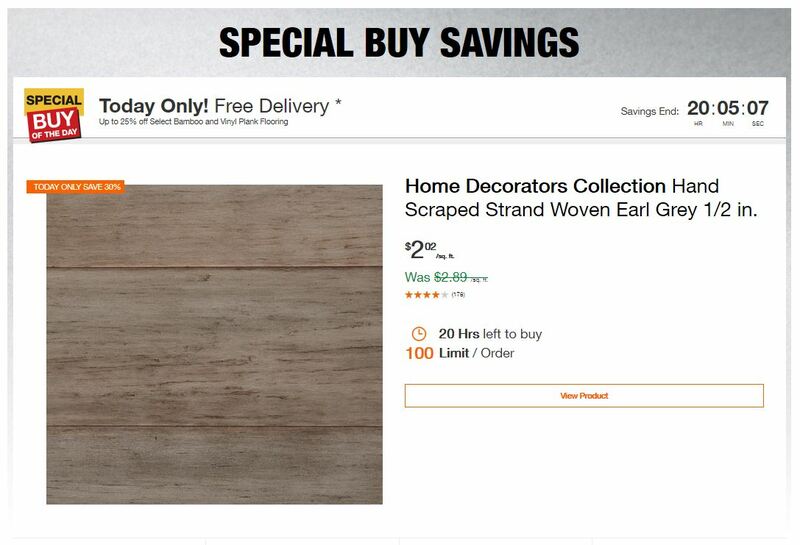 Home Decorators Collection Hand Scraped Strand Woven Brown 1/2 in. T… only $1.87/sq. 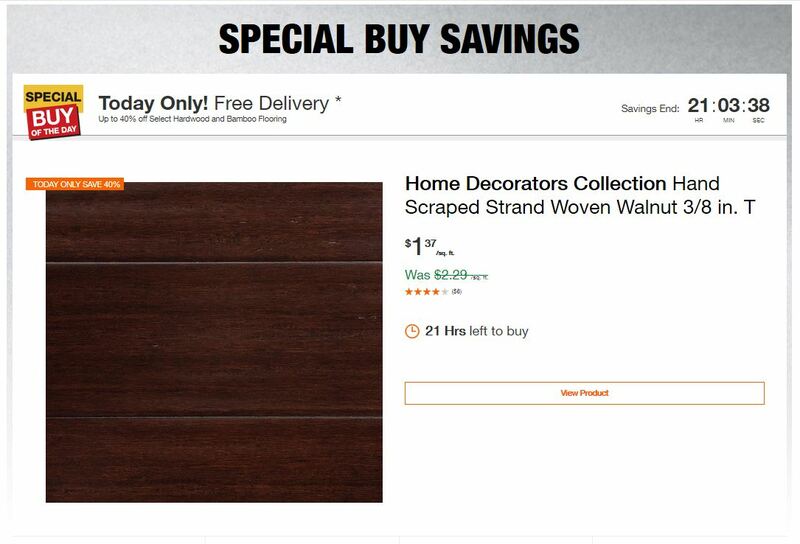 ft.
Home Decorators Collection Hand Scraped Strand Woven Hazelnut 3/8 in… only $1.97/sq. ft.
Home Decorators Collection Hand Scraped Strand Woven Sahara 3/8 in. … only $1.88/sq. ft.
Home Decorators Collection Strand Woven Mahogany 1/2 in. T x 5-1/8 i… only $1.79/sq. ft.
Malibu Wide Plank French Oak Newport 3/8 in. T x 6-1/2 in. W x Varyi… only $2.99/sq. ft.
Malibu Wide Plank Hickory Capistrano 1/2 in. Thick x 6-1/2 in. Wide … only $3.74/sq. ft.
Malibu Wide Plank French Oak La Playa 1/2 in. Thick x 7-1/2 in. Wide… only $3.74/sq. ft.
Malibu Wide Plank French Oak Montara 3/8 in. T x 4 in. and 6 in. W x… only $2.99/sq. ft.
Malibu Wide Plank Hickory Vallejo 3/8 in. T x 6-1/2 in. W x Varying … only $2.99/sq. ft.
Blue Ridge Hardwood Flooring Hickory Sable 3/4 in. Thick x 3 in. 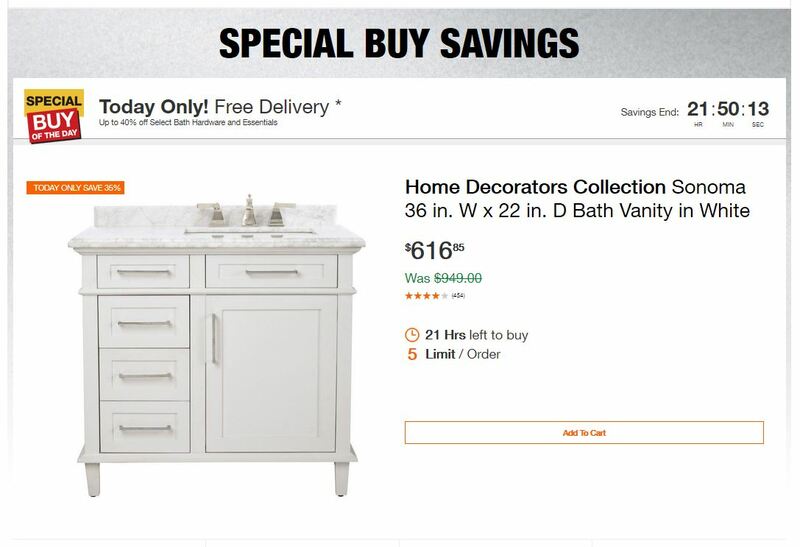 Wid… only $3.00/sq. ft.
Home Decorators Collection HandScraped Strand Woven Herringbone 3/8i… only $1.79/sq. 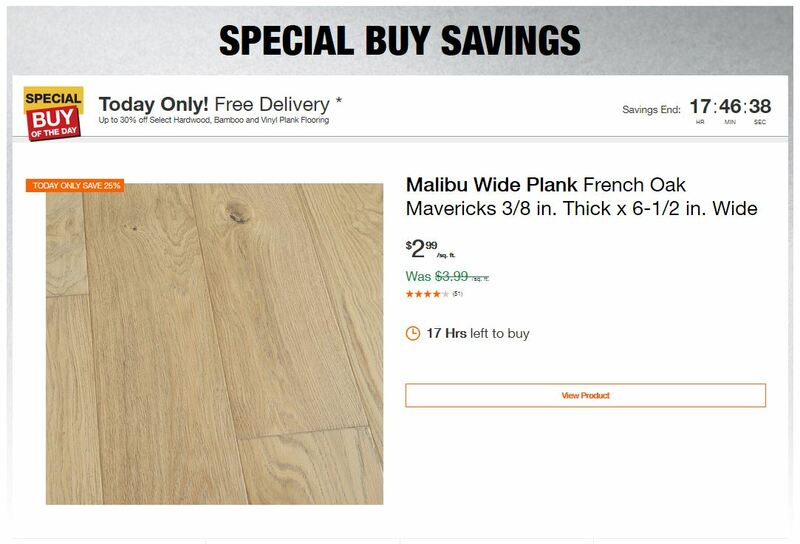 ft.
Malibu Wide Plank French Oak Mavericks 3/8 in. Thick x 6-1/2 in. Wid… only $2.99/sq. ft.
Malibu Wide Plank French Oak Point Loma 3/8 in. T x 6-1/2 in. W x Va… only $2.99/sq. 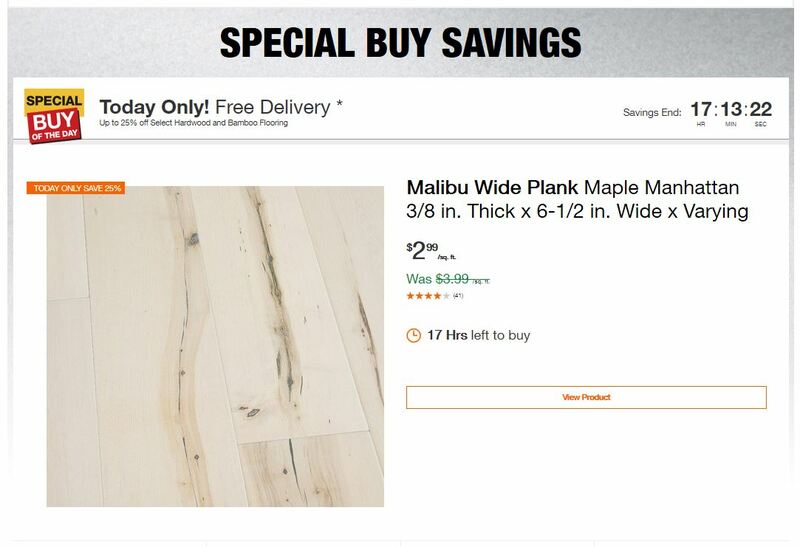 ft.
Malibu Wide Plank Maple Pacifica 3/8 in. Thick x 6-1/2 in. Wide x Va… only $2.99/sq. ft.
Malibu Wide Plank Maple Cardiff 3/8 in. Thick x 6-1/2 in. Wide x Var… only $2.99/sq. ft.
Malibu Wide Plank French Oak Half Moon 1/2 in. T x 5 in. and 7 in. W… only $3.73/sq. ft.
Malibu Wide Plank French Oak Montara 1/2 in. T x 5 in. and 7 in. W x… only $3.73/sq. ft.
Malibu Wide Plank Maple Zuma 1/2 in. Thick x 7-1/2 in. Wide x Varyin… only $3.73/sq. ft.
Malibu Wide Plank Maple Zuma 3/8 in. Thick x 6-1/2 in. Wide x Varyin… only $2.99/sq. ft.